Pinky is made from a fuzzy pink material covered in a bright pink feather pattern. Her face is made from a fluffy pale pink material. 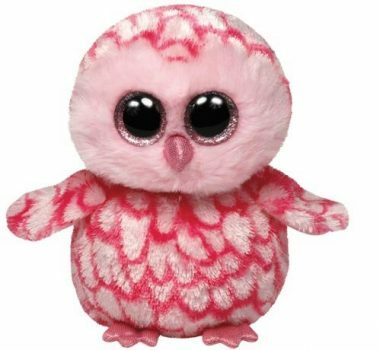 Her large button eyes and sparkly pink and black and she has a glittery pink beak and feet. Pinky the Barn Owl was introduced on 19th June 2013. There are five versions of Pinky. She was released as this small 6″ Beanie Boo, a medium 9″ Beanie Boo Buddy, a large 16″ size, an extra large 25″ size and a key clip.